Plants of the Petrophile genus are closely allied to plants in the Isopogon genus, but differ most obviously by producing persistent cone scales (protect the seed), whilst the Isopogon cones readily disintegrate to release seed randomly. 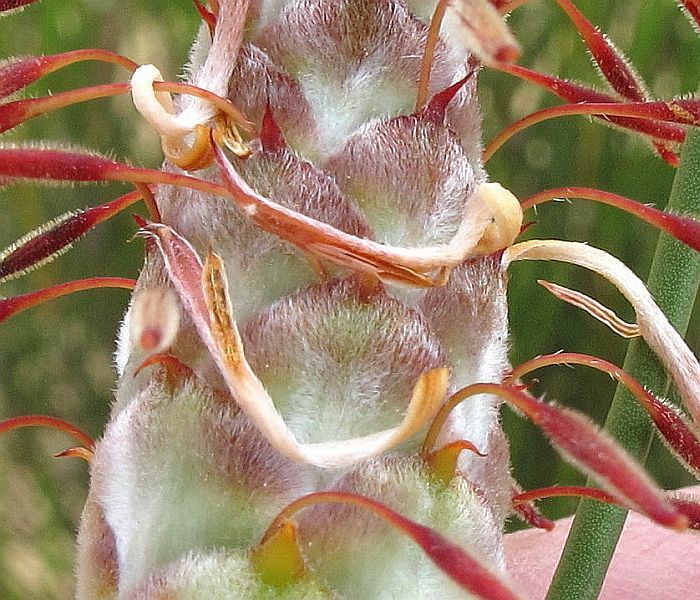 The above is an interesting species, in that the perianth (sepal/petal like structure that initially covers the reproductive parts, ie ovary, style, stigma and anthers) is soon discarded, leaving only a handsome arching pollen presenter. 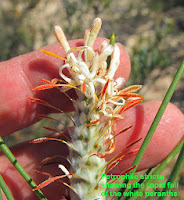 A pollen presenter is an adaptation of the stigma, whereby it also carries its own pollen that has been transferred from the anthers when the flower was in bud. So to avoid the stigma from ingesting its own pollen, the stigma portion develops more slowly, and only matures to accept pollen from other flowers, after its own have been shed. This feature occurs on a number of plants, but is particularly well-developed in plants from the Proteaceae family. With Petrophile stricta, foraging insects will carry off pollen grains and (hopefully) visit a slightly older flower to accidentally deposit some grains on the tip of its pollen presenter and thereby cross-pollinating to produce viable seed. This procedure is easily observed with honeyeating birds, who when dipping their beaks into the perianth (flower) to reach a nectar reward at its base, will brush the top of their head against the pollen presenter, permitting pollen grains to adhere. 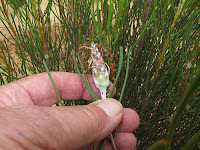 When doing the same thing at another flower, some of the pollen on its head will be transferred to the new flower. 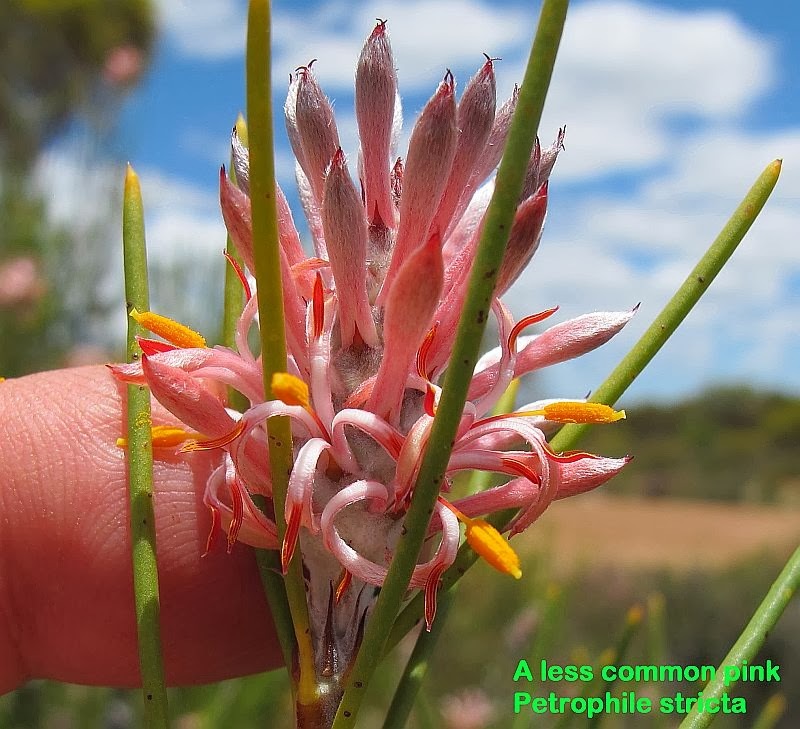 The problem for Petrophile stricta and its small deciduous perianth is it does not produce nectar, therefore must attract a different pollinator other than birds and mammals, so instead attracts insects probably by producing an odour from the pollen presenter. Therefore small insects like flies would do the cross-pollination by visiting several flowers with an assortment of sticky pollen grains attached to them. It must also be borne in mind that Petrophile stricta is restricted to a low-rainfall inland mallee zone and flowers during the hottest time of the year. 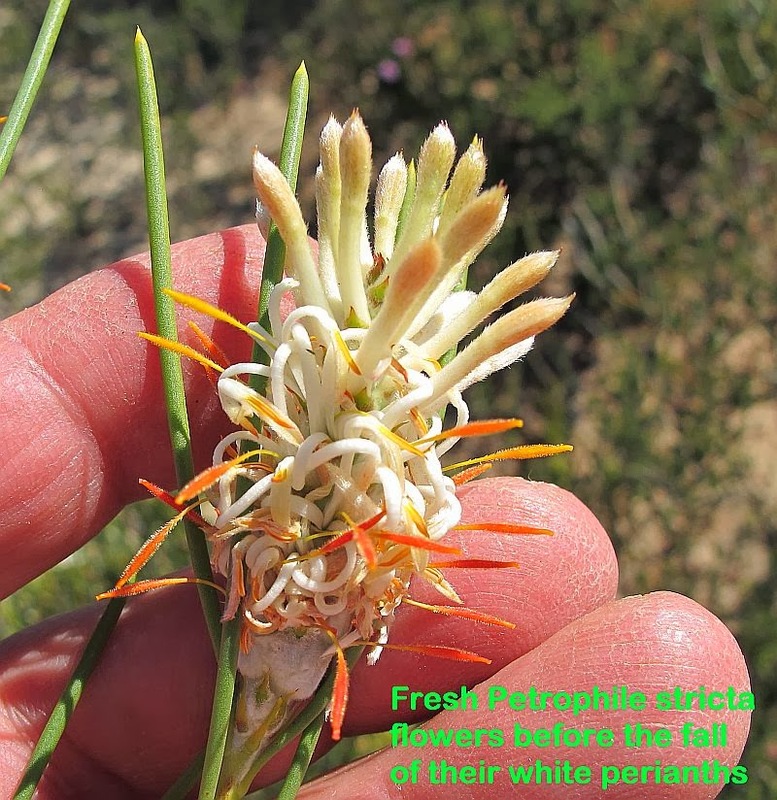 This would mean, if the plant had to produce nectar at this time of year it would be haphazard and unreliable due to the normally dry conditions, plus the flower would need to be much larger and brightly coloured to catch the eye of nectar eating birds. Whereas it is far easier and cheaper to produce a small amount of odorous material to attract insects that will do the job just as effectively, therefore making this plant not only well adapted to its environment, but able to reproduce with remarkable efficiency. 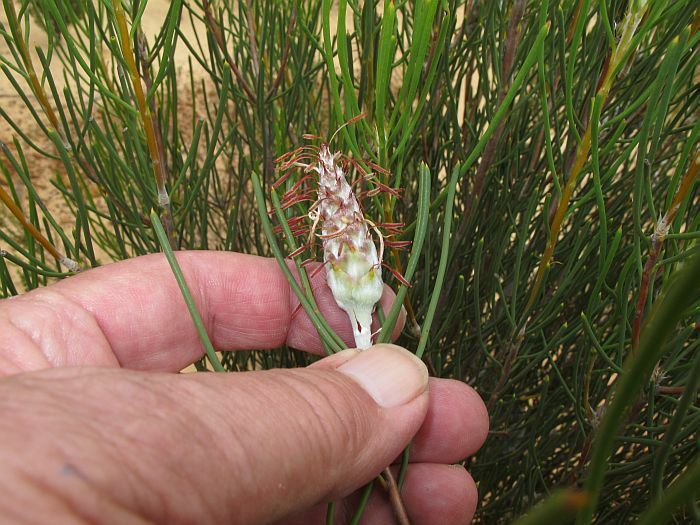 Petrophile stricta grows to 2 metres in height and is recorded flowering from October to December, although I have only seen it in bloom during January and February, so local weather conditions would probably influence this event. 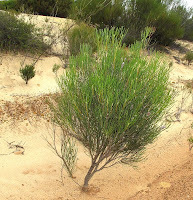 Locally it grows in sandy soils, often over clay/gravel and appears to be widespread, although usually as single plants or small colonies. 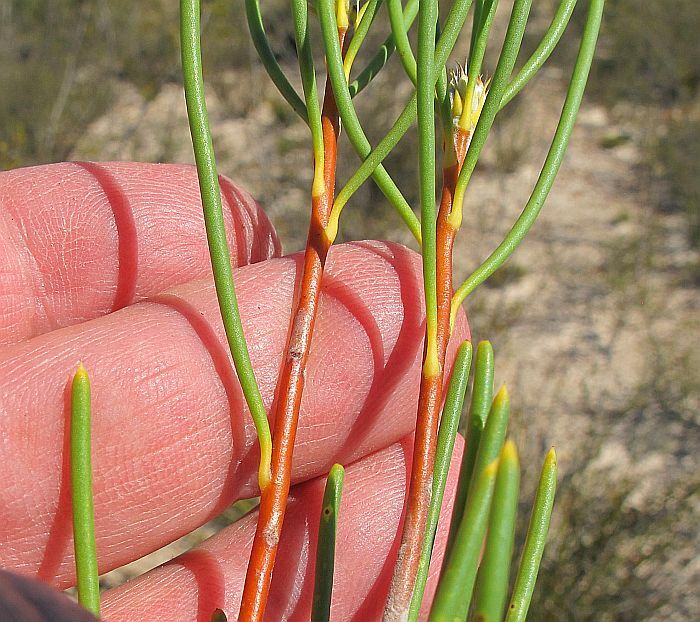 The near vertical leaves are circular in cross section (terete), but are not sharply pointed. 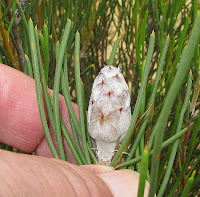 The cones are very large for Petrophile plants, being around 5 cm (2”) in length and when young, attractively covered in soft silken hair. 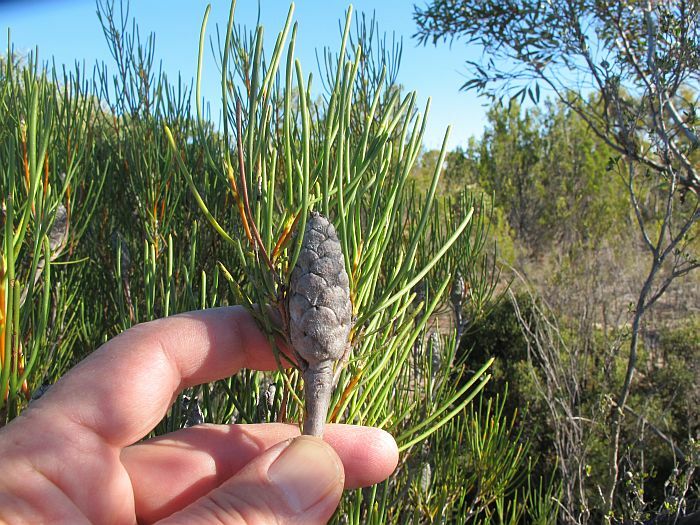 This species occurs from the Lake Tay area (140 km or 90 miles NW of Esperance), to Lake King (230 km or 140 miles NW of Esperance), then to Southern Cross to head east to the Coolgardie region. The large tract of land (approximately 200 km or 125 miles square) which is surrounded by the above distribution points is pristine country with few access tracks and would certainly contain more of this species and probably many other currently unknown and interesting flora. 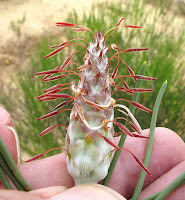 Petrophile belongs to the large, ornamental and extremely diverse Proteaceae family of Gondwana origin. Three photos added and one removed. 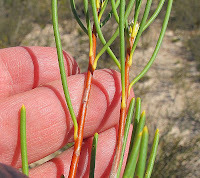 The added ones are those with text and were seen flowering in December.